AQIS&apos; innovative matting tested for safety by the CSIRO. As Australia’s workforce ages, more and more people are becoming aware of the wear and tear on bodies imposed by standing for long periods. Quite apart from the distraction to work in hand posed by discomfort, one of the most common and costly threats to a workplace safety program is the slip and fall accident, the danger of which increases as the workforce ages. Standing workers are usually on their feet for at least four hours a day, and some, for an entire shift. In fact, industrial and service industry employees are working more hours than ever – and as more processes become automated, there is an even greater need for people to stand while performing their jobs. One employer that has been quick to recognise the human and financial benefits of preventing discomfort and accidents is the Australian Quarantine and Inspection Service of the Department of Agriculture and fisheries, AQIS. 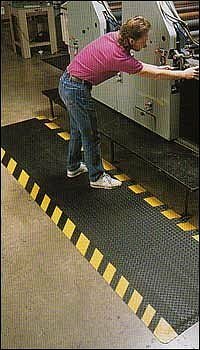 AQIS recently installed an internationally acclaimed safety, ergonomic and anti-fatigue matting at mail processing centres in NSW and Victoria where workers stand for extended periods in screening, inspection and processing areas. AQIS consulted with the General Mat Company before specifying Safety Alert SpongeCote No. 416, one of the largest-selling products of its type in the world and manufactured by the Tennessee Mat Company in the USA, where worker welfare and accident prevention is a national priority. Safety Alert SpongeCote No. 416 features a tough diamond embossed Koroseal® vinyl surface for optimum traction, with a 10mm thick Nitricell™ sponge base for industry benchmark standards of comfort. Suitable for all dry work areas and resistant to chemicals, abrasions and fire, the performance of Safety Alert SpongeCote was proven recently when General Mat Company submitted it for testing by the Building, Construction and Engineering Section of the CSIRO. The CSIRO conducted assessments under its Slip Resistance Classification of New Pedestrian Surface Materials programme. The tests included wet pendulum tests and dry floor friction tests to AS/NZS 4586-1999. "Possibly for the first time in the history of the Australian safety matting industry, we have scientifically proven just how good these products are," says GMC Managing Director Mr Michael Siegle. "Users of the product can now demonstrate with scientific certainty the effectiveness of safety programmes which incorporate the product," he said, adding that 1.2km of Safety Alert SpongeCote has also been installed at the new Australia Post Letters Centre in Dandenong, Victoria.